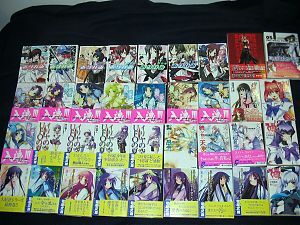 Neechin.net - article - Anime - Books - Book addiction - meet international shipping. Book addiction, meet international shipping. Okay, I’ve never really tried to hide it, but my book addiction is sloowly getting out of hand. Relatively lately I’ve been on a light novel kick. Now, I don’t think I can get away with calling it ‘a kick’. Today, two boxes arrived via SAL shipping. after about 2 weeks fo waiting, give or take. One box was 4800g, and the other 1400g. Total cost of shipping, about 6400Y. Not too shabby. BK1 is going to get me in trouble. Unlike amazon, they have the option for SAL shipping, which is significantly cheaper than EMS. It of course takes correspondingly more time, but that’s no big deal. Amazon.jp now seems to use FedEx for their international shipping, I got my box in 2 days. I paid more for the box than I did the books. I still have… alot more books that I want. Maybe in a few paychecks. Things like, the full set of Full Metal Panic novels (long stories only, that’s about 8 books right there). Not to mention a few short series that seem somewhat interesting. Anyways… I can say one thing so far. The Muvluv novels are nice. They actually got a decent writer (actually a game scenario writer) to work on it, and the story from the little I’ve skimmed so far, tries very hard to bring the original stories of the game across in the shorter light novel format. The Extra books (vol 1+2) actually have a new special ending in collaboration with Age because the author couldn’t choose just one girl! Probably once things settle down, I’ll actually write little snippets about my reading as time goes on. I want you to know, though it is 30 volumes, I consider you a god with all those novels. It was in stock, so I bought it. Same with Iriya. Whether it’s in or out of print has little to do with that fact. Hmm.. – is in the process of trying to find a relation between the previous blog entry and this one – Nope, nothing. Totally didn’t just glimpse half a rotten corpse of a certain ero-gamer, slowly shredding its skin like a snake. Changing, slowly turning into.. discosnake. Or a bookworm. First one sounds cooler though. Episodes? Wha? These are novels. What’s more, there’s a link to the shop I bought these in the article itself, and they’re in stock. Moreover amazon.co.jp has plenty too. Ya, the novels can amazon send them to America. If you can’t figure this simple stuff out by yourself, buying a stack of 8 novels will amount to wasting over $50. If you still want them, go bother an import/deputy service.